These are the remains of No. 3 mill, so named because they are located on working level 3 from the top of the site. This mill was built in 1856 when it took over from the much smaller No. 2 mill. No. 3 mill had a short life and from 1867 all operations were concentrated on No. 9 level. In the centre of the view can be seen the ruins of the barracks on No. 4 level. This early barracks had an evil reputation for being draughty, cold and filthy. Seemingly the one which replaced it on No. 9 level was nearly as bad! The summit of Cnicht is in the background. The remains of the incline drum house on level 4 can be seen here. This worked a gravity incline down to level 7 where a further incline led to level 9. 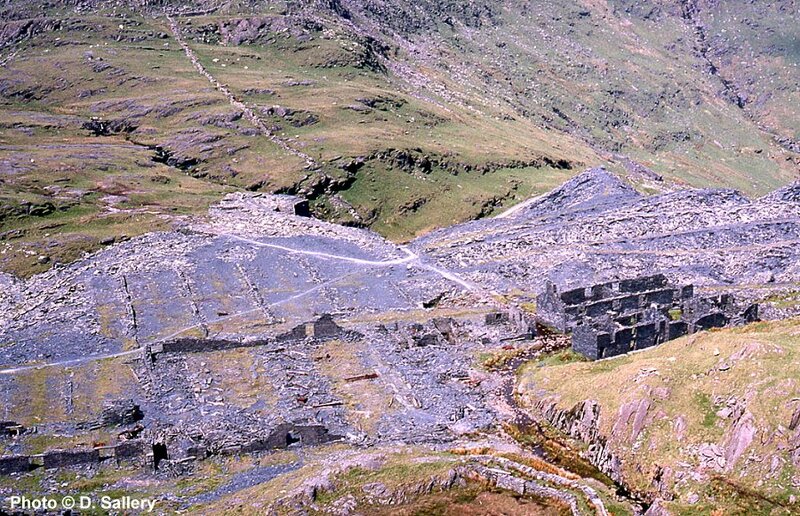 Above the drum house can be seen the exit tramway to Croesor and Porthmadog making its sinuous way alongside the side of the mountain. There was an adit into the mine at this level and also a smithy. 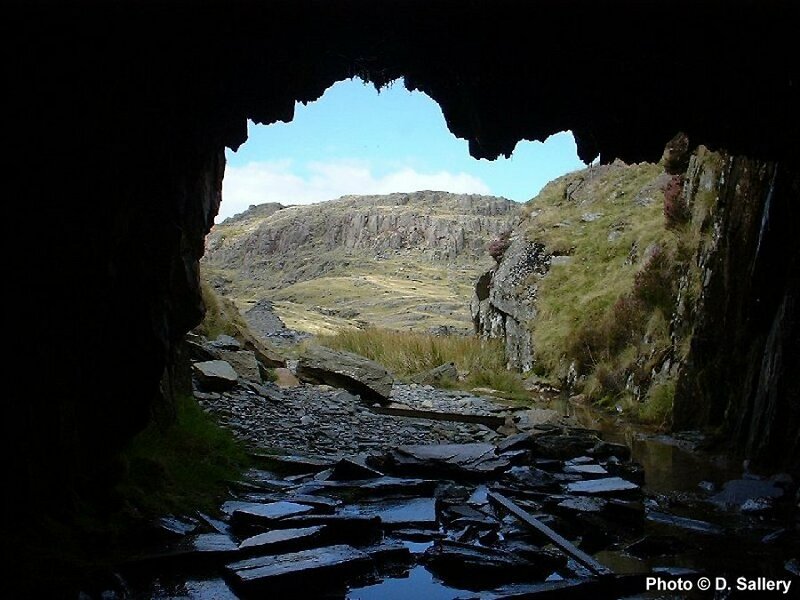 The adit and smithy were probably abandoned in the 1890's. 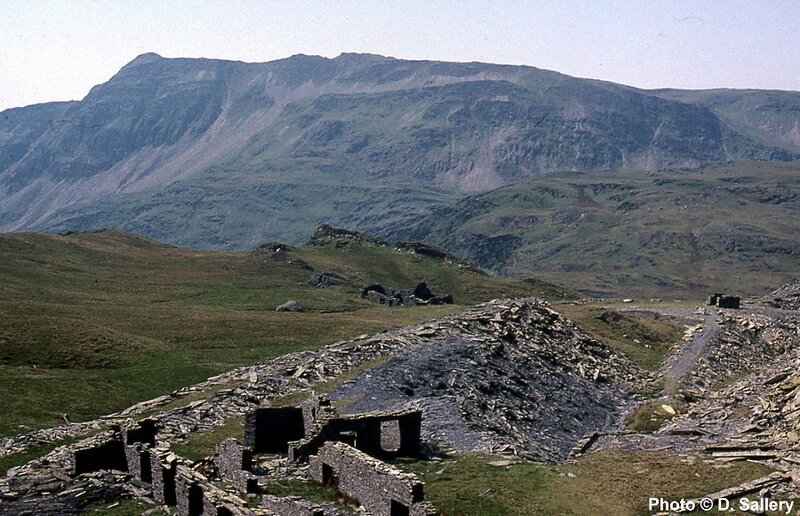 The summit of Snowdon can be faintly seen in the top right. Looking down onto level 9 from level 7. Level 9 became the hub of the quarry and was where the main mill and barracks were located. The outline of the mill can be clearly seen in the bottom left centre of the view with the stock yard for the finished slates beyond. The main mill was rebuilt and extended several times over the years and assumed its final outline after 1910. All sawing and dressing of slates then took place in this building. 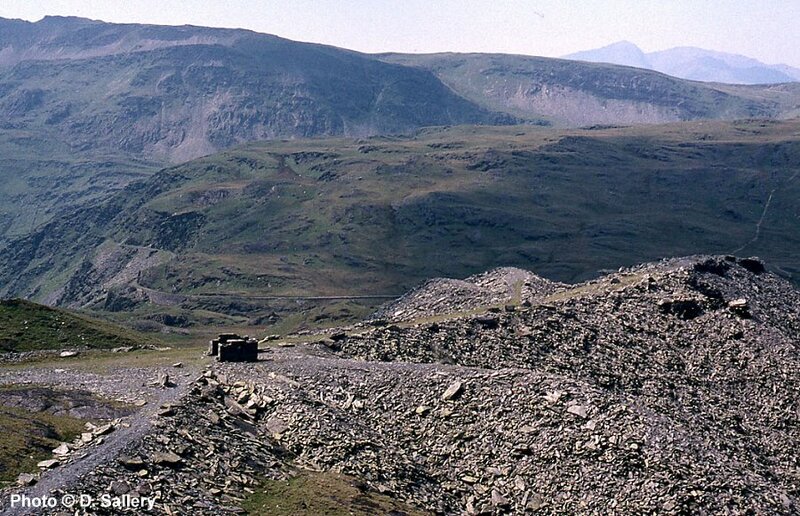 The tramway to Croesor and Porthmadog used to leave the quarry to the left. 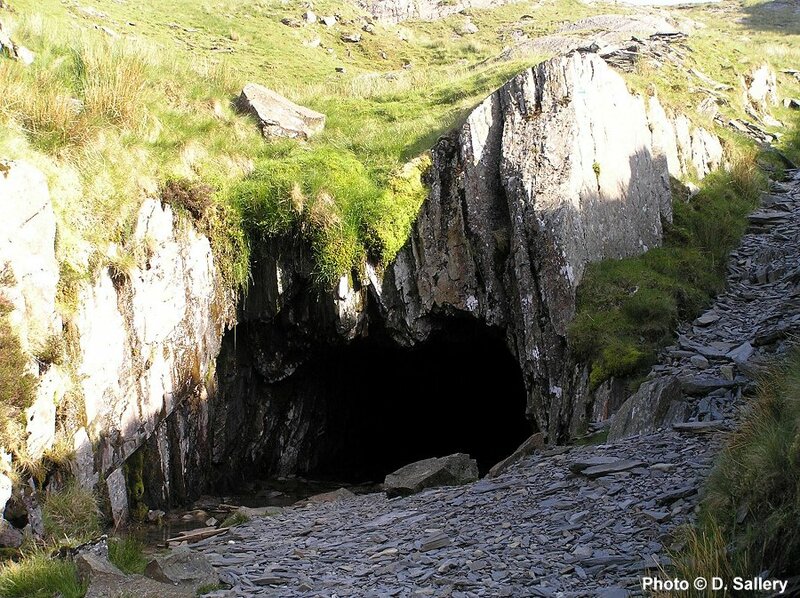 The stream in the bottom right marks the entrance to 9 adit, which via internal inclines led to all the working levels inside the mine. This entrance, the main adit, was over 2200 feet long and wagons were hauled in and out using a continuous rope haulage system. The rope was powered by a water wheel situated between the main mill and the barracks. Special transporter wagons called "megryns" had an attachment to grip the cable and these were marshalled at each end of a rake of wagons. A curious feature of this adit is that the double line of track only used three rails, the centre rail being common to both. 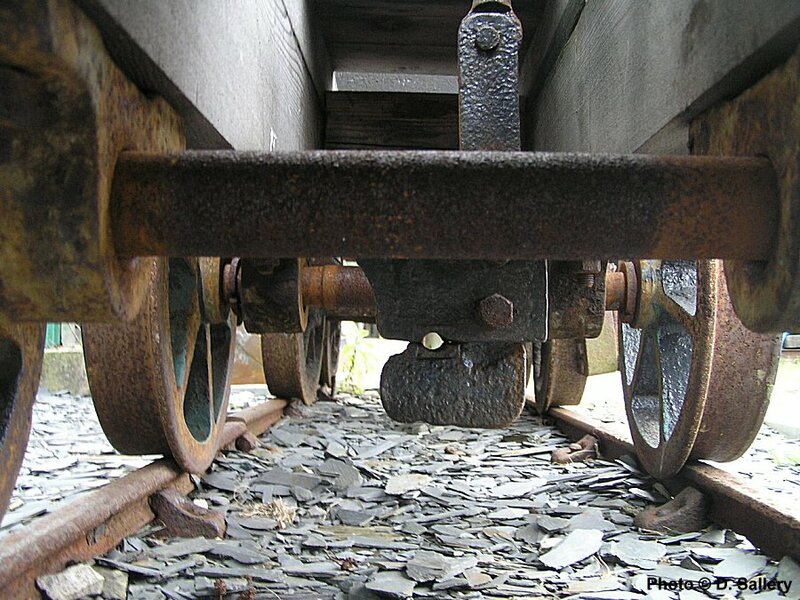 This meant that wagons with double flanges, common in other quarries could not be used at Rhosydd. There was a loop halfway along the adit where outgoing loads passed ingoing empty wagons. Below is the view looking out of the adit. gripping mechanism underneath the vehicle. Looking north east at the ruins of Rhosydd on Level 9. 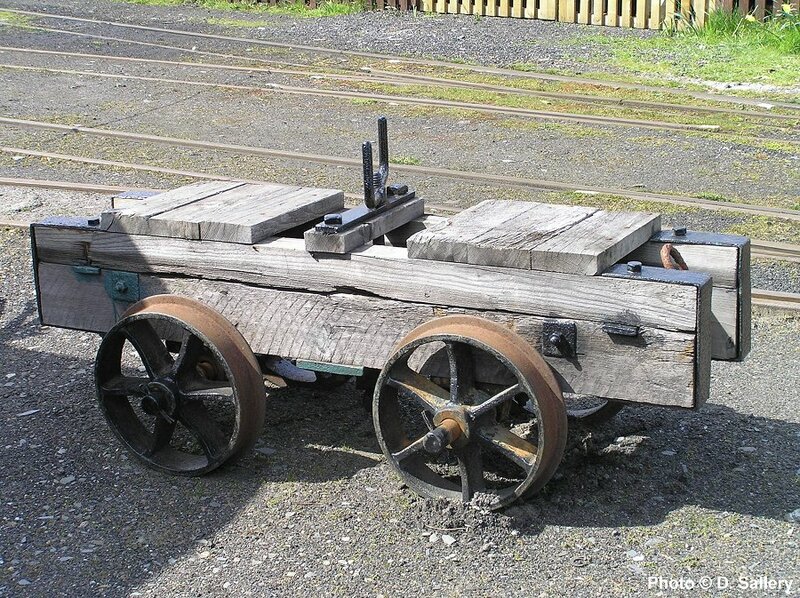 There were no locomotives at Rhosydd and all other rail haulage used man, water or horse power. 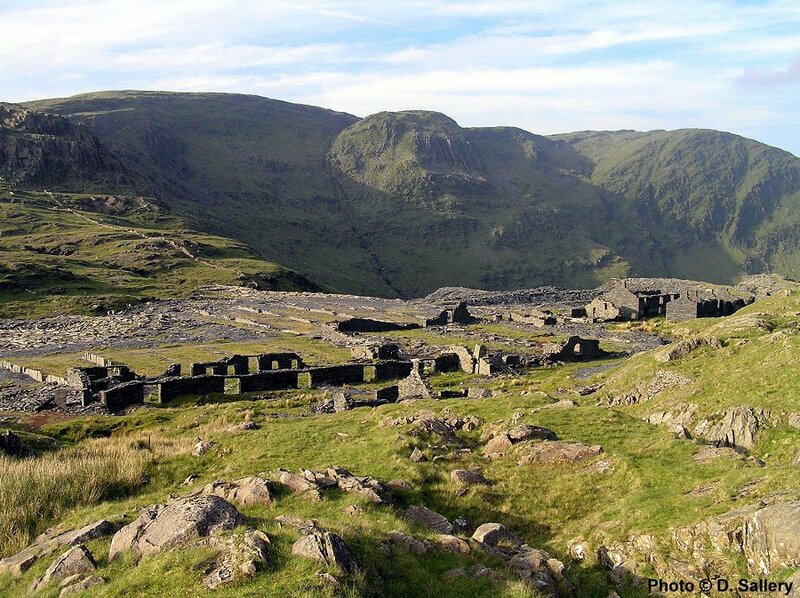 The ruins of the mill can be seen in the centre left, with evidence of some of the walls. In its final form this mill contained 30 saw tables and 30 dressing machines. The roof of this building and others on site were removed in 1948 and the machinery, by now beyond repair, had gone by 1952. On the right is the famous quarrymens barracks of two terraces of houses.